Gryphon, the 1970s, medieval folk-prog band, announced earlier this year that there would be a short tour of the UK. I’m not sure what prompted the tour (they didn’t mention in the promotional blurbs about it being a 40th anniversary of the release of the excellent Raindance album), but maybe they felt it was time to fire up the crumhorns and malleted drums again. They did play a one-off reunion show at the Queen Elizabeth Hall in 2009 – but I wasn’t fortunate to get tickets to that one. I was determined to see one of the 2015 gigs and ordered a set of two for the Union Chapel show in London. I met up with another Gryphon fan (Pixie did say that she wasn’t really up for the trek to The Big Smoke) and his missus near Soho and we drank a couple of pints at a pub I hadn’t been to – then grabbed a quick tube journey to Islington. I was hungry, so my friend’s wife and I ordered some grub at a Weatherspoons joint, almost right across the road from Union Chapel. The show was meant to start promptly at eight p.m., so we rocked up just before then. No sooner had we chosen a pew (literally, it is a still-used place of worship and the seating is in the pews), then the boys filed out to the stage to generous applause. It’s quite a lovely venue – high ceilings and stained-glass windows give a ‘sacred’ air, but somehow, it’s oddly secular at the same time. 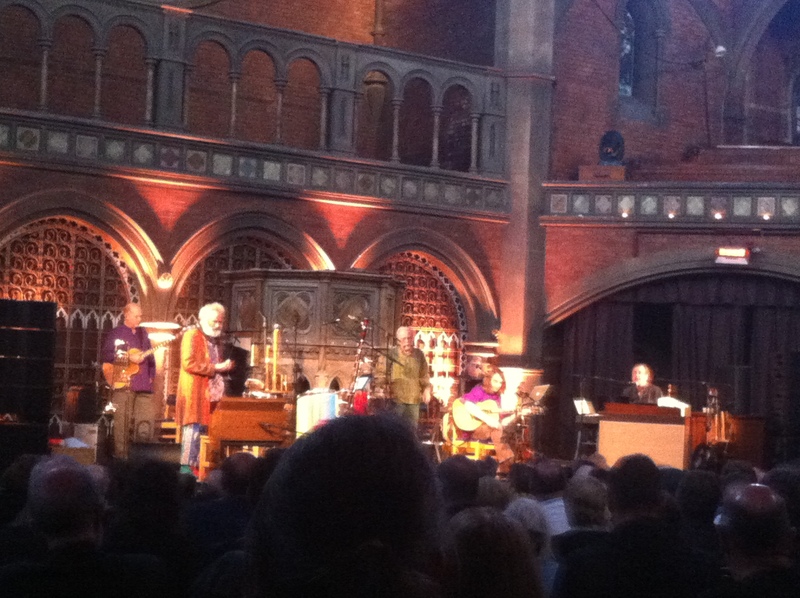 The band were arranged in front of the massive pulpit, with Richard Harvey on the right side of the stage, sat at a keyboard and Brian Gulland and drummer Dave Oberle on the left. Sandwiched in between were guitarist Graeme Taylor and multi-instrumentalist Graham Preskett. Bassist Jonathan Davie was a bit to the back, behind Gulland. They opened with an energetic “Renaissance Dance Medley“, which never appeared on an LP – but was played in a BBC session in 1974. They followed that with a nice version of “The Astrologer“, from the first Gryphon LP, released in 1973. Gulland and Oberle traded vocals, as the characters in the song, and the rest of the group backed them through the tricky melody. A lively “Kemp’s Jig” was next, also from the first album. In fact, as Harvey announced in-between tunes, most of the first set would be from the debut. After a really spooky rendition of “The Unquiet Grave” (the tone of the song heightened by the concert setting), Graeme Taylor performed a guitar solo in a ‘mock-classical fashion’, as he put it, called “Crossing The Stiles” (also, you guessed it, from the first album). 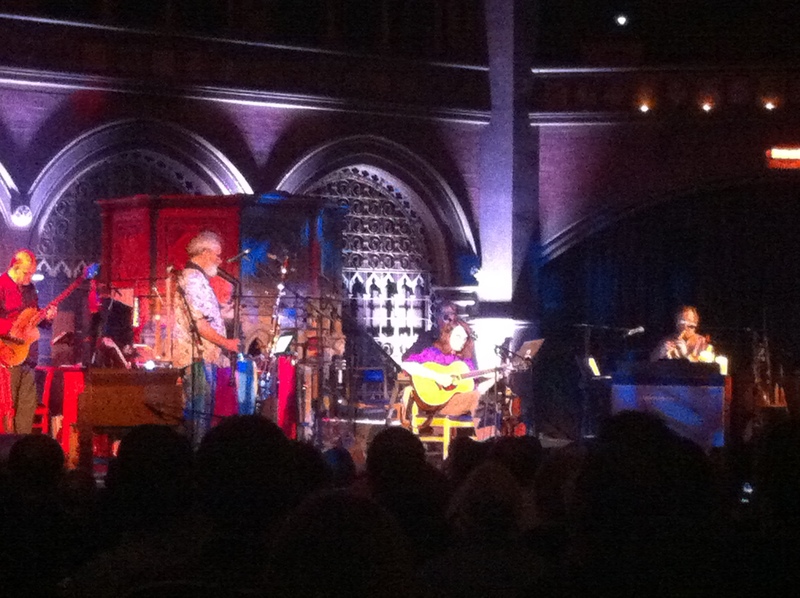 “Juniper Suite” followed, with Gulland deftly moving from bass crumhorn to harmonium and back. The first set concluded with “Dubbel Dutch“, the lone choice from their second LP, “Midnight Mushrumps“, first released in 1974. There was a 20-minute interval for people to head to the bar, or the toilets (or both). We got back to our pews in time for the second set to begin with “Midnight Mushrumps“, the entire 18-minute piece. It was so great hearing it live and almost note-perfect (actually, it may have been, as I’ve only listened to it a small number of times). Gulland again switched between crumhorn and bassoon and Harvey would swap his keyboard for a tin whistle. Spell-binding stuff! An ‘unreleased’ song followed. It’s called “Ashes“, written by Graeme Taylor during the “Raindance” sessions in 1975. Transatlantic Records decided it didn’t fit the album and it was cut from the LP. It was eventually released on the “Gryphon – The Collection II” CD. A nice wistful tune, Brian explained that Graeme wrote it on a nice spring day near to a river, where the recording studio was located it definitely has that vibe to it. It was then “Red Queen To Gryphon Three” time, which I was excited about, as it’s my fave Gryphon LP. First up was a really nice “Lament“, played beautifully, then a “muddle-y” (Harvey’s word) of “Red Queen…” themes. It was great seeing the interplay, particularly between Gulland and Harvey. I didn’t quite catch the title of the final tune in the set, I heard Harvey say something about “our roots” and thought he announced the tune as “Yulattis“, but it may have been “Estampie“, from the first album. No matter, ‘cos it was a great little jam. The encore was an extended version of “Le Cabrioleur Et Dans Le Mouchoir“, from “Raindance” – it had a nice little rave-up at the coda, with Gulland firing out blasts from a trombone. The crowd (including myself) were on their feet for an ovation. So glad I was able to see them live! The fan I attended the concert with is an old friend of the group and he was able to get me into the after-party in the upstairs floor/bar of the chapel. I said “Hello” to Brian and Graeme and had brief chats with Dave Oberle and Jonathan Davie. Richard Harvey talked for a moment with the bloke I went to the show with, but I didn’t get to talk with him. We left quite late and the tubes had all finished by then, so I got a cab back to Victoria Station, and a coach back to Oxford. All in all, a brilliant show and night! Here’s to hoping they’ll do it again soon (with maybe an Oxford show thrown in). Not really familiar with Gryphon – would you recommend Raindance as a starting point? Hey Rob! Yeah, “Raindance” is a pretty accessible album – it’s got a nice cover of The Beatles’ “Mother Nature’s Son” on it as well. I’m more partial to “Midnight Mushrumps” and “Red Queen To Gryphon Three”, but those are pretty proggy and put some folks off. If you can’t it locate it, let me know and I’ll send a copy. Thanks for the report. Sounds fantastic. You’re welcome, V.C. – yeah, it was a brilliant show! Great review. It must have been wonderful to catch up with these legends. I was pleased when I heard they were back in action. Politics: What Is The Point, Exactly?